I distinctly remember the day I first heard about Hotel Chocolat and feeing excited there was a chocolate hotel. Until reality struck that it was in fact the name of a premium chocolate brand. Although delighted by their chocolate there was always a slight disappointment that the Hotel Chocolat was merely an illusion of my imagination for a number of years. That was until recently discovering there was in fact a Hotel Chocolat in St Lucia. The hotel I had dreamt about existing for years. 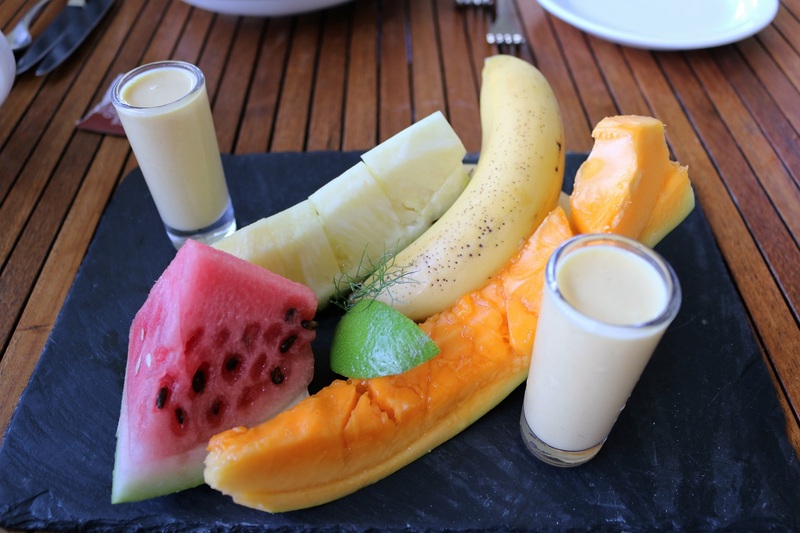 Eat, breathe and sleep chocolate in the Caribbean. That’s my idea of bliss. So with many holiday destinations being picked on a whim of the cuisine I felt like having, this one was no different. I love chocolate so it’s almost non-sensicle to not at least go and try the chocolate experience I’d been searching for. After a stomach churning, windy ocean drive, up and down through rainforests and volcanos. Passing shabby huts on stilts, one arrives in chocolate paradise. Hotel Chocolat’s Boucan is like no other. 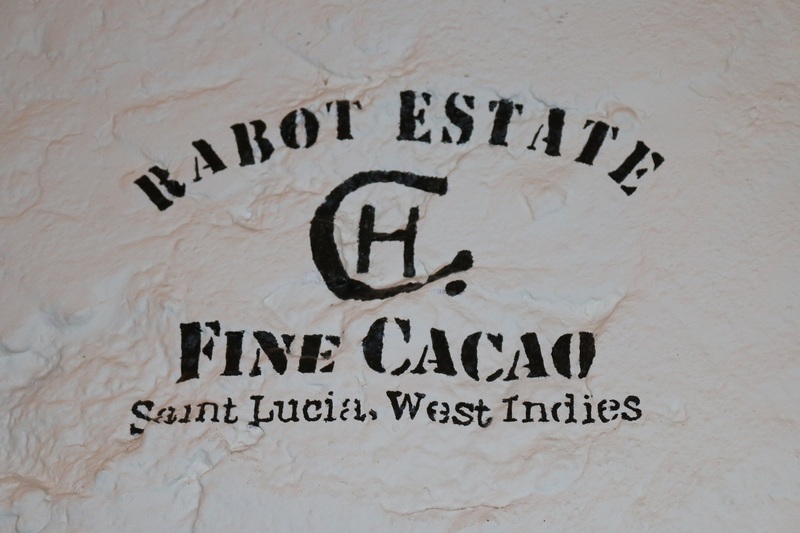 The Rabot Estate cocoa plantation is set high in the rainforest with unprecedented, breathtaking views overlooking the pitons. The surrounding scenery is rather dramatic and picturesque. 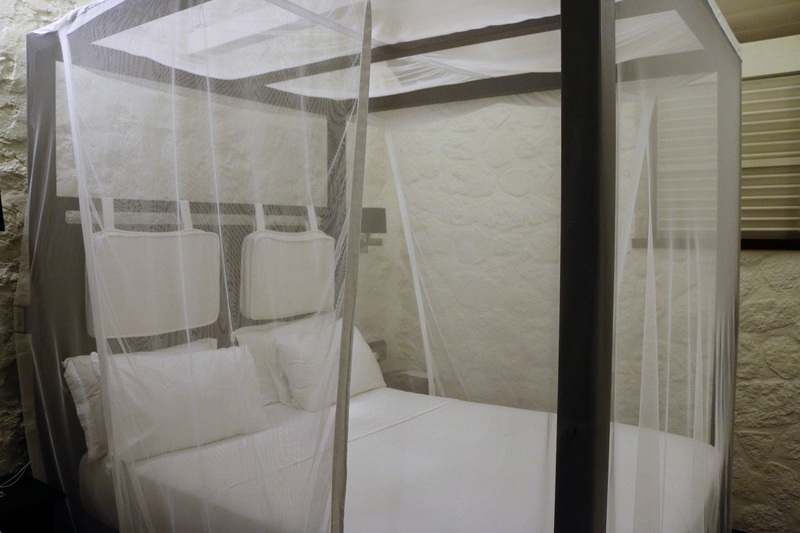 A boutique hotel with merely thirteen rooms. It’s set high in a lush green rainforest with palm trees all around. 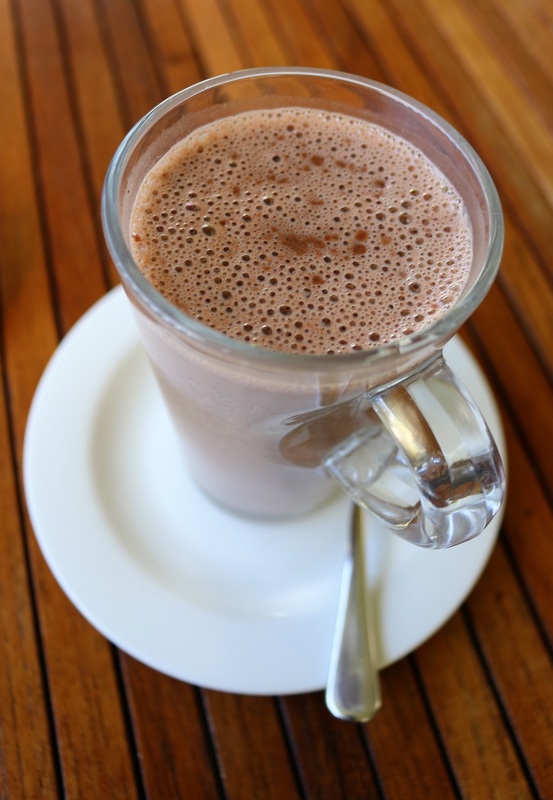 From the moment you arrive there’s cocoa everywhere. I was hoping for a chocolate aroma, but instead there were occasional reminders of the natural surroundings with little whiffs from the local sulphur springs diffusing through. Fortunately this was only when the wind blew in the wrong direction. 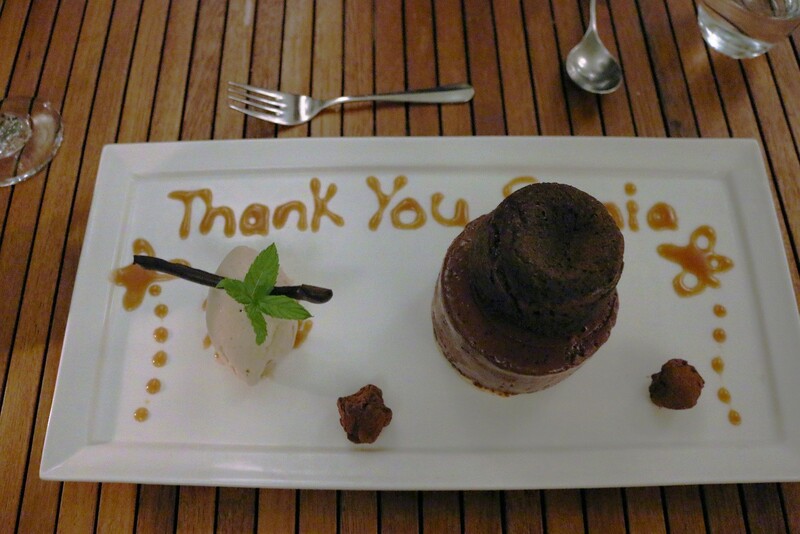 There is obviously great expectation of what a chocolate hotel would be – one cannot help but expect lots of chocolate. Dreaming of chocolate walls and bath tubs of chocolate, but in reality this would be impossible. So there is not chocolate everywhere per say, but believe you me there is enough chocolate and cocoa around. It’s all pure, dark, good quality chocolate. 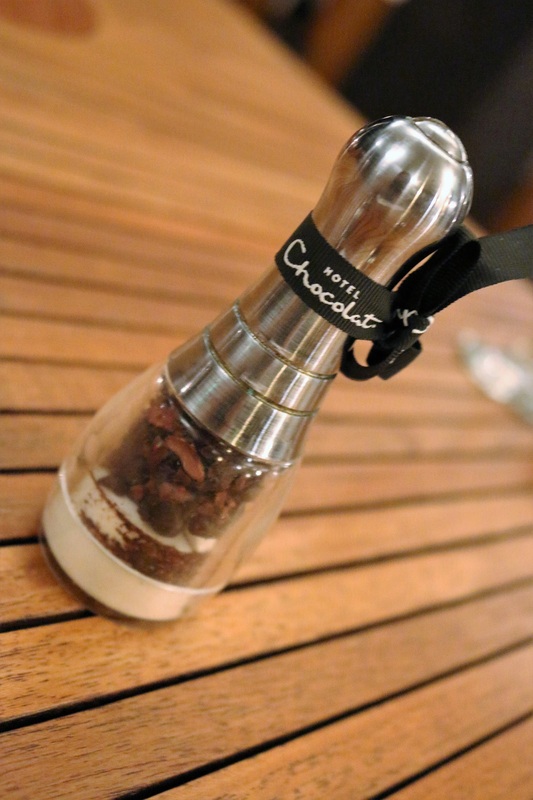 At the restaurant there’s salt, pepper and a cocoa nibs mill. The menu is slightly overwhelmingly scattered with cocoa, and as much as I love chocolate and often joked I could eat it all day long, there was a slight aprehension at the mention of it in every course. 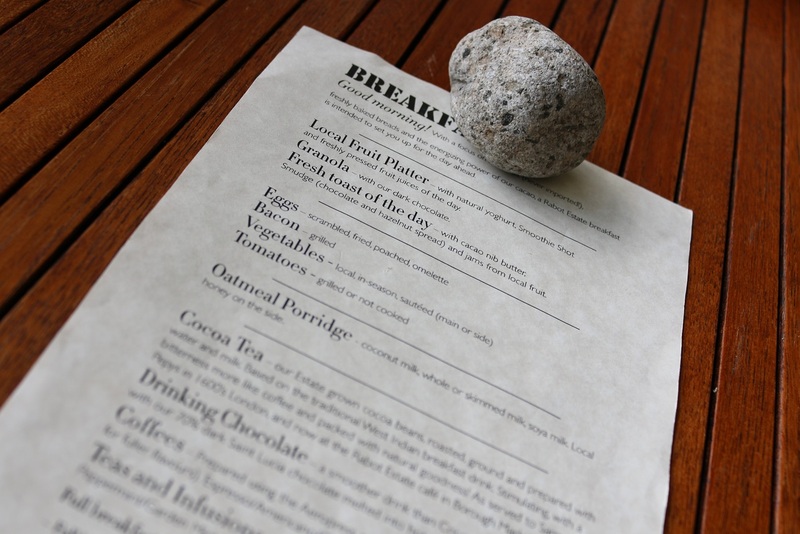 Breakfast, lunch and dinner unsurprisingly had dashings of cacoa. 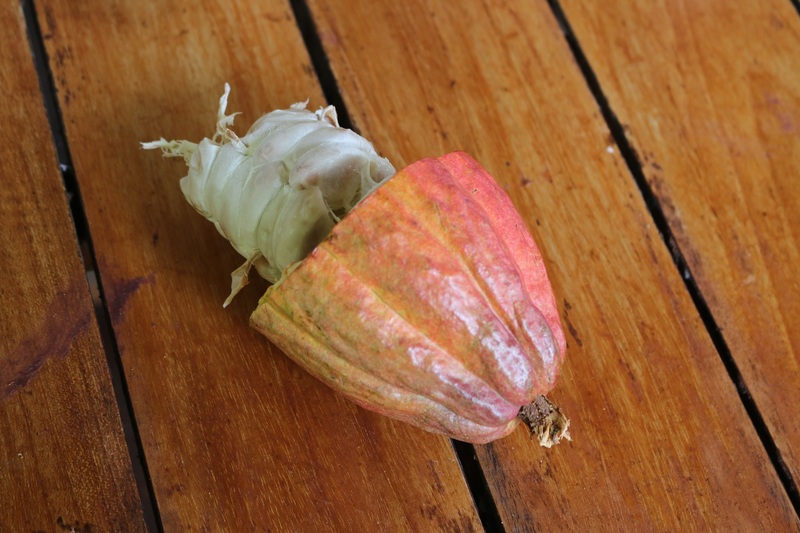 Cacoa is used in a savoury fashion in St Lucia’s Boucan. There’s few restaurants we frequent, especially when on holiday. But when staying at the hotel serving the best food in town, there’s a tough act to follow. It becomes hard to deviate. 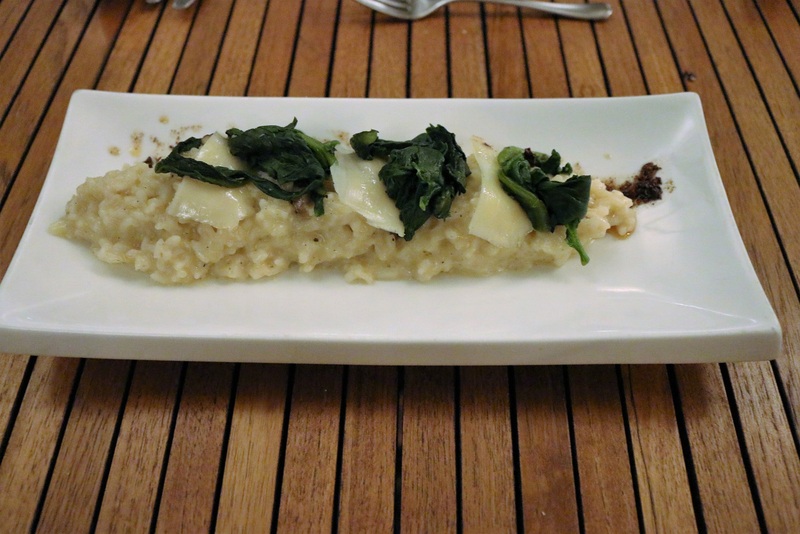 So for six out of seven days we tasted most of the menu at Boucan. Each night the food was spectacular and surprising. 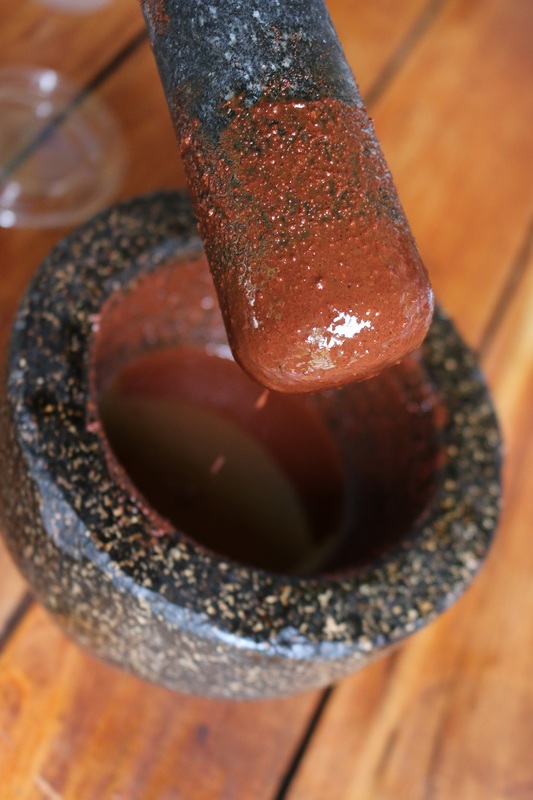 From the initial wariness of cocoa in all our savoury dishes, we began to crave it. Morning breakfast started with a slightly bitter, hot 70% liquid chocolate and platters of tropical fruit. The smudge was a home made chocolate and hazelnut spread which I found dipping in the granola was like making your own truffle. 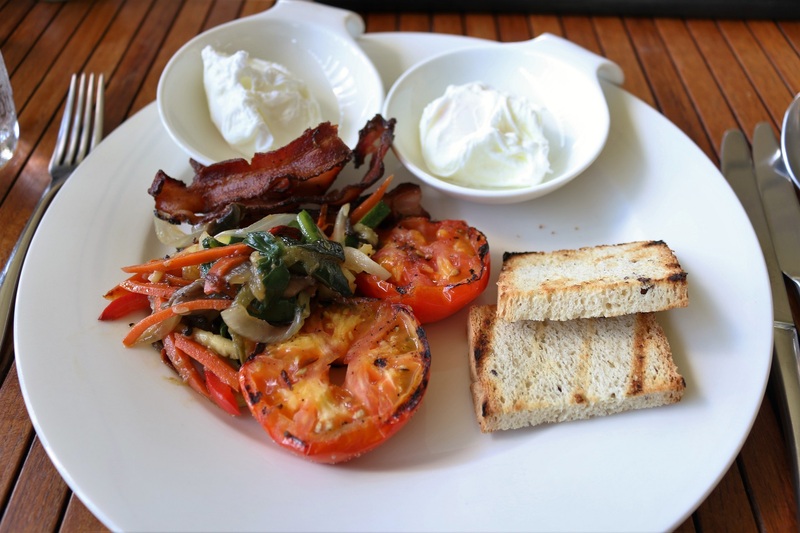 The poached eggs served with bacon, vegetables and grilled tomato were perfect everyday. The lunch menu of grilled cheese sandwiches with drizzles of cocoa was a perfect afternoon snack. 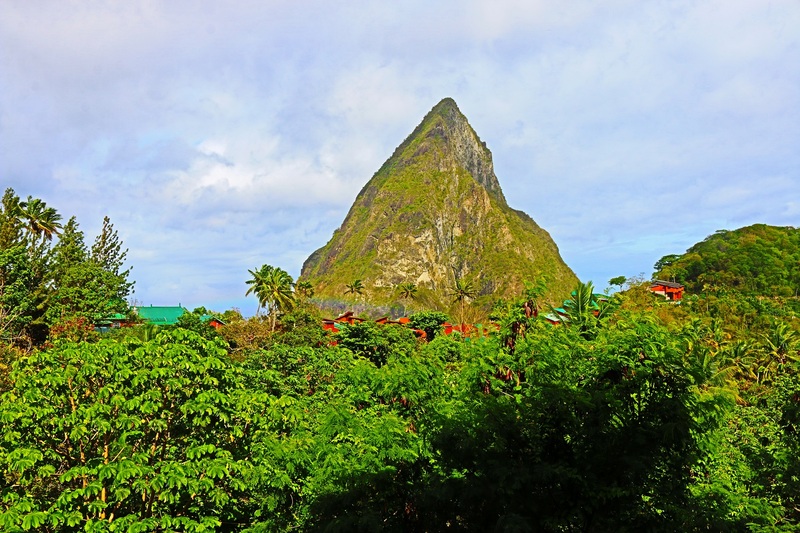 Dinner at the Boucan overlooks the rainforest and pitons with a glimpse of the sea. Six nights on we could order without looking at the menu. 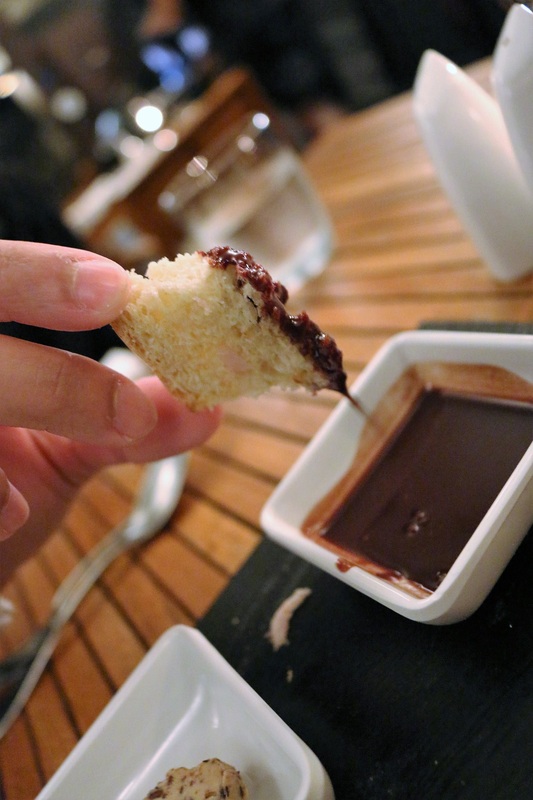 The bread studded with cocoa nibs was served with balsamic cocoa and cocoa pesto and cacao butter. Soon you become accustomed to it and look forward to the cocoa hit. It’s a subtle enhancement to every dish. 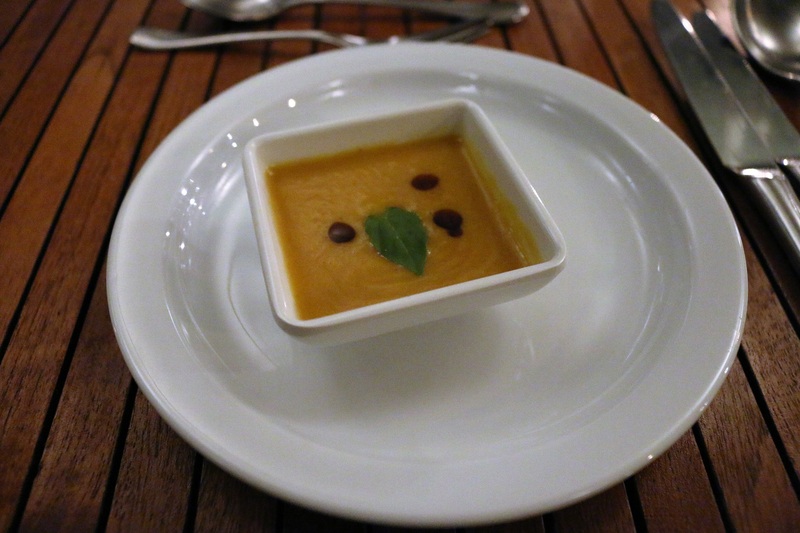 The amuse bouche soup would vary daily but the warm coconut soup was our firm favourite. 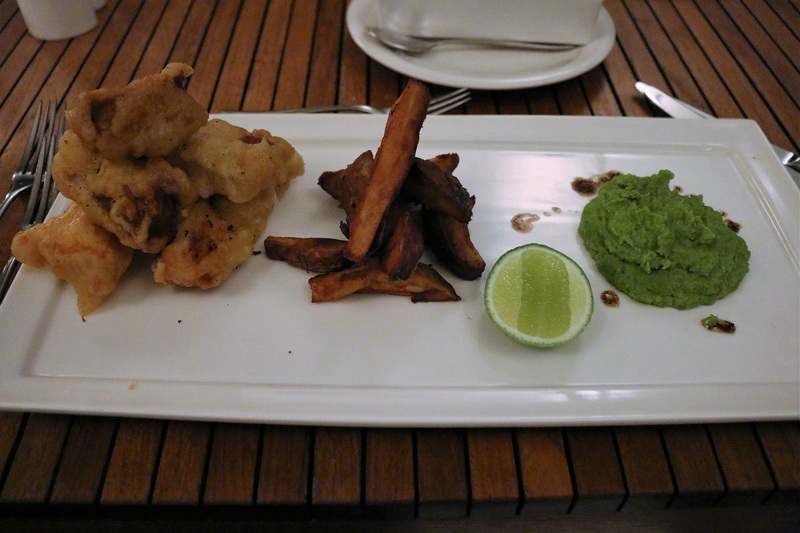 Local Fish in a cocoa batter with sweet potato chips came with minty mushy peas and a tomato relish. This was a just the perfect, hearty meal. The Pork served on a bed of finely diced vegetables on a bed of mash and a cacao mint sauce was divine. 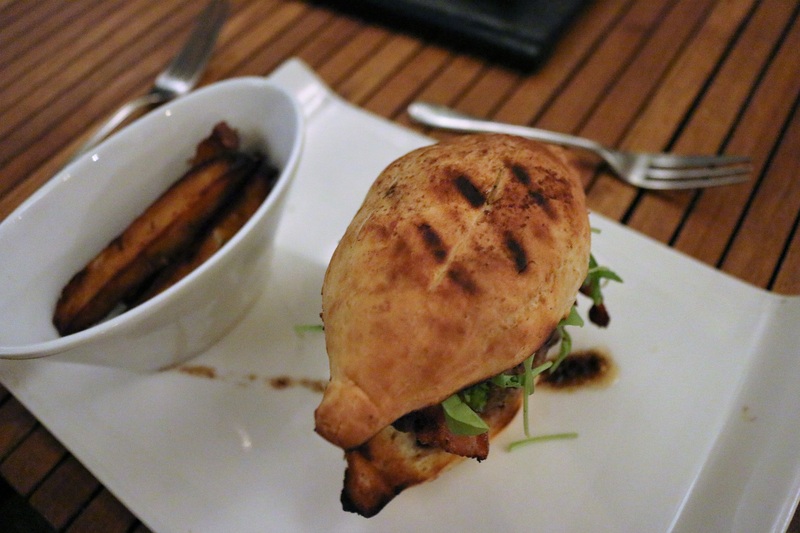 The burger served in a cocoa pod shaped bun with sweet potato fries was divine. 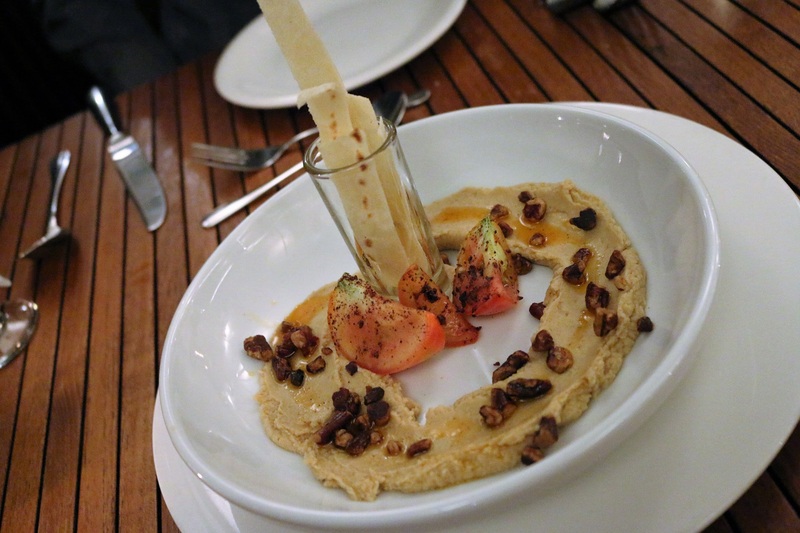 Hummus with peanuts and flat breads was mouth-watering. The Chocolate lava cake exhuming molten chocolate was a dream. The light, fluffy meringue surround in a sauce with caramel, flaked almonds was delightful. The rooms are elegant and simplistic. There’s open shutters and you feel at one with nature. There is an open rain shower and the wooden lodge structure barely keeps out the elements. Open shutters allowing you to feel at one with nature. In theory that’s great until you find birds freely flying in and perching on the sofa. After a little scream and shooing we decided perhaps being at one with nature was better with the shutters closed. We were here for the chocolate adventure, and our trip need not to be shared with the the the creepy crawlies of the forest. Every evening we looked forward to the chocolate cookies and dark chocolate awaited us in the room. Boucan, Hotel Chocolat is up in the forest but has a complimentary shuttle and boat service to the nearby Viceroy Hotel’s Sugar beach. 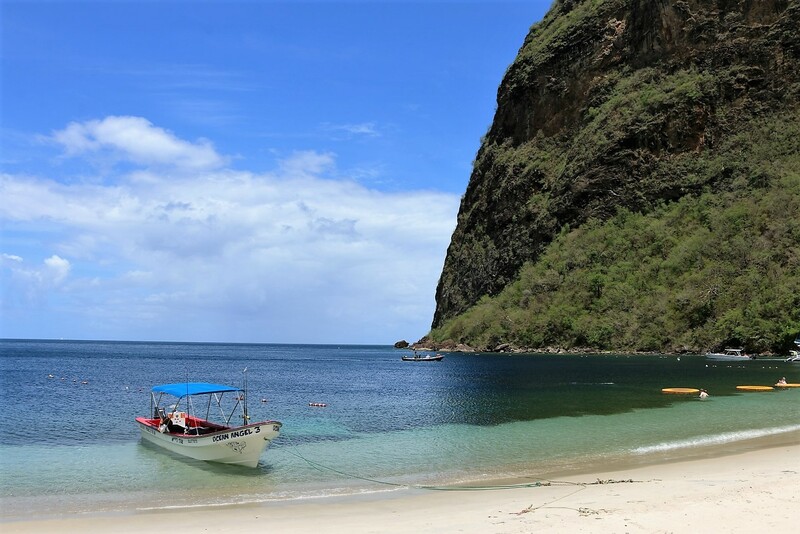 With powdery sand in the shadow of the pitons, it is picture perfect. It’s perfectly located for excursions to the nearby volcanic sulphur springs. 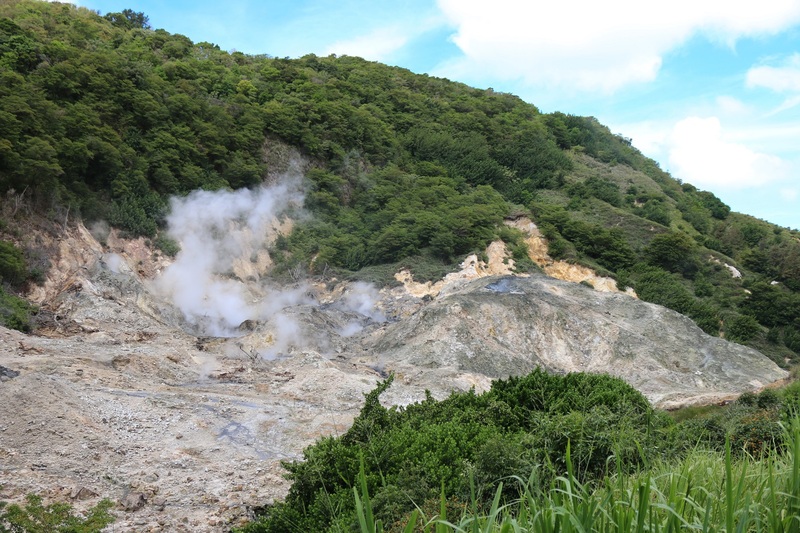 A drive in volcano that seems to be bubbling away but reassured that’s it dormant. The water is naturally heated to 38 degrees where one cannot visit without donning some mud and having the minerals enhance their skin. 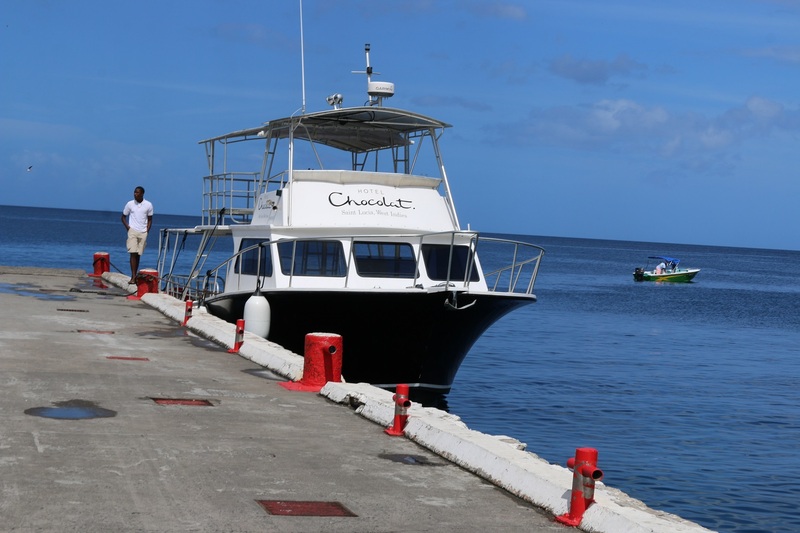 Get there early to avoid the crowds arriving from cruise ships. 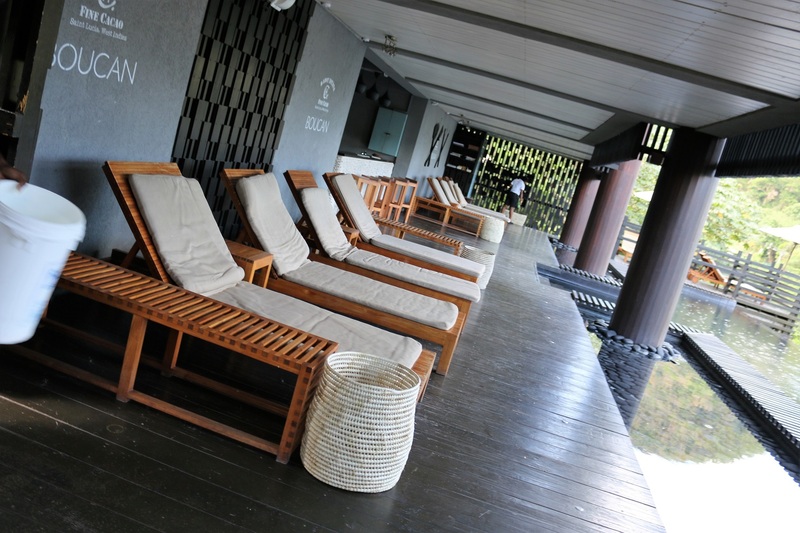 The pool area at Club Boucan is quaint and chilled which can be refreshing once the Carribean heat reaches its peak. 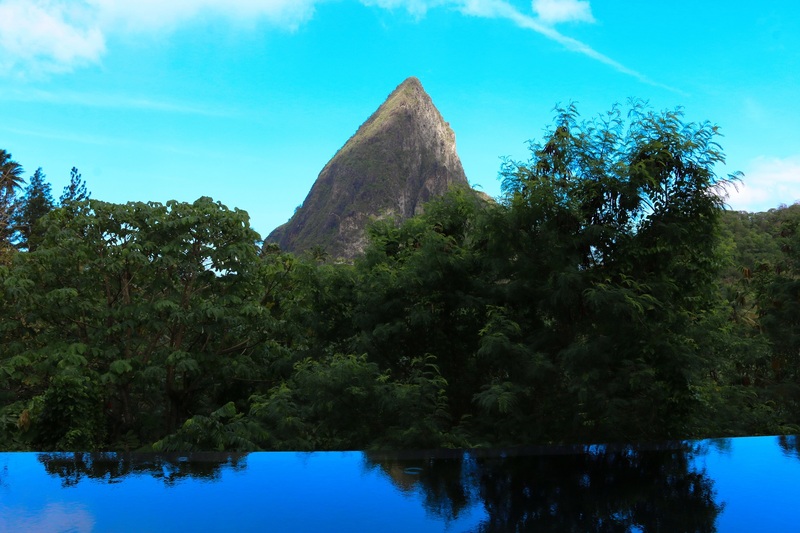 The views over the forest and pitons is rather tranquil. Soon one becomes accustomed to the tree frogs and birds tweeting all day and night. 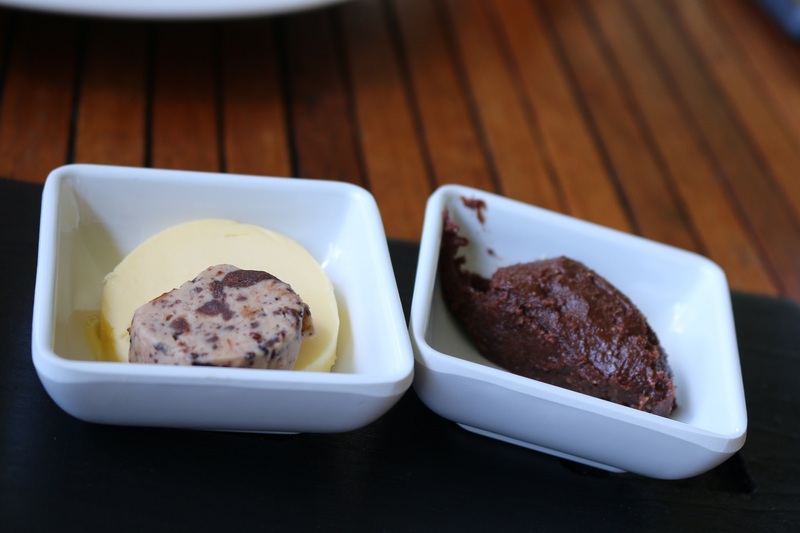 A stay at a chocolate hotel cannot be complete without exploring the grounds and learning about all the chocolate processes. 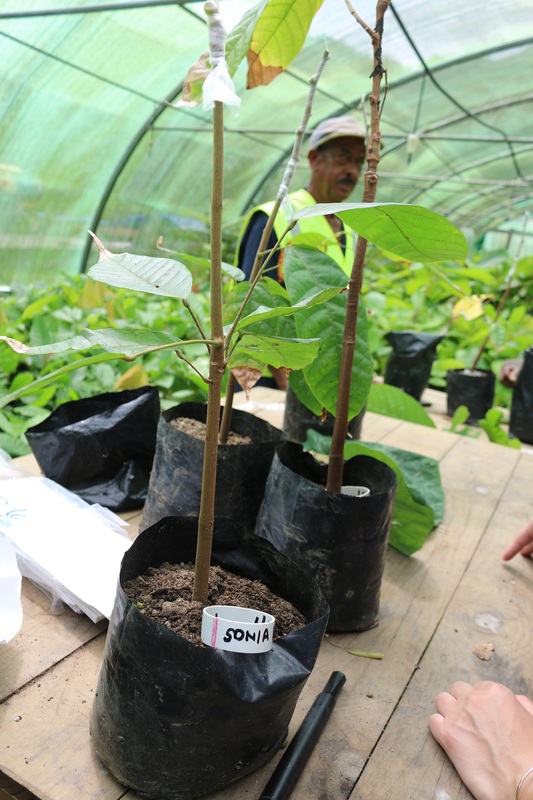 The tree to bean hour tour is both informative and exciting. 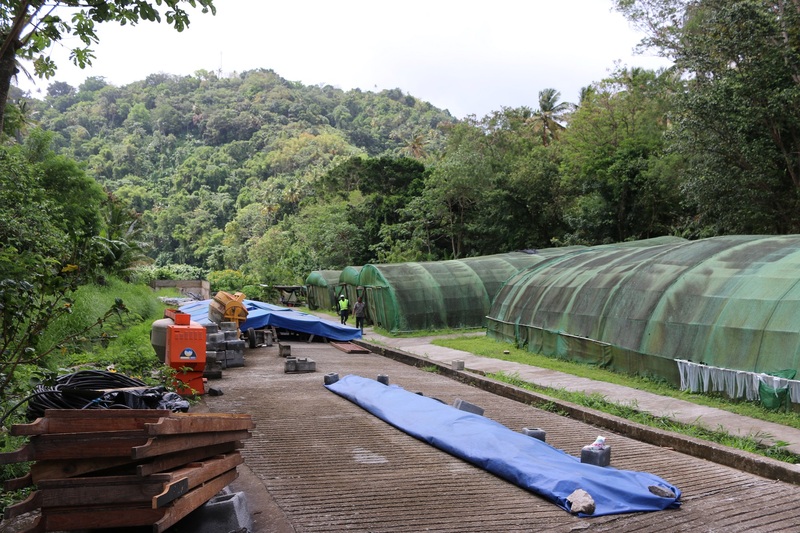 From picking the cocoa pods from the tree to watching the workers hacking them open with machetes and then to see the fermentation process and roasting. Having a little nibble at every stage it’s a wonder how it was discovered to make chocolate. The raw cocoa products are actually disgustingly bitter. 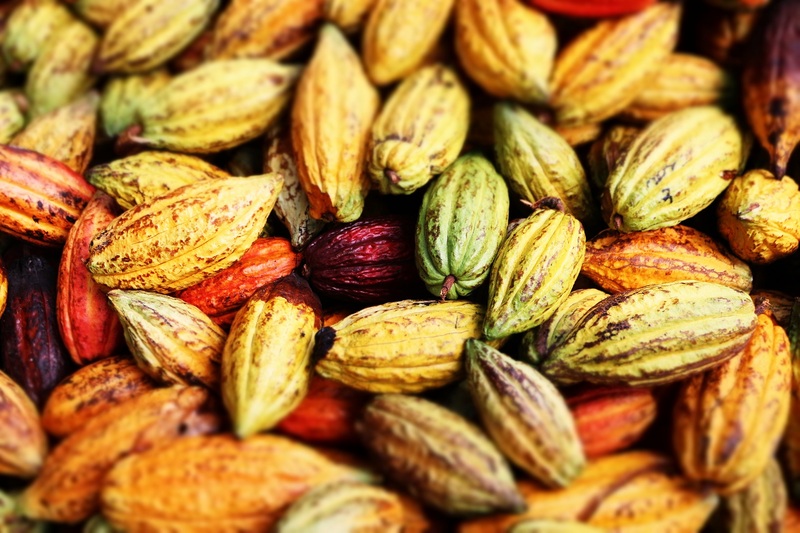 The pulp of the cocoa pod is fruity and sour whilst it’s the cocoa bean inside that has all the goodness. Having planted our own cocoa tree we joined the bean to bar tour after a quick cocktail at the Boucan Bar. 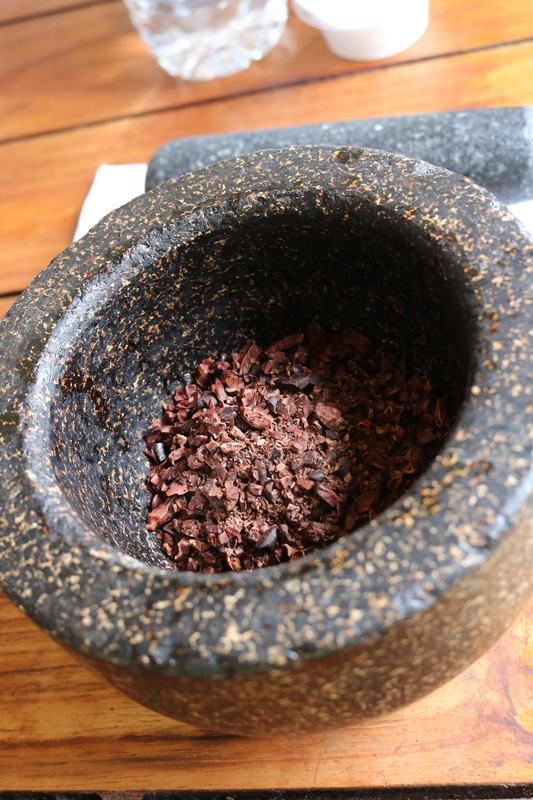 Pounding tirelessly at the cocoa nibs until ground to a smooth paste in a hot mortar, sugar and cocoa butter were added. This is not as easy as one might expect. The 62% liquid chocolate was poured into moulds and we waited for it to chill until it’s good enough to eat. An amazing chocolate making experience like no other. So with a new found respect for chocolate making we think it’s fine to pay a small fortune for it to be handed us in the form of a bar. Hotel Boucan had the perfect hints of chocolate everyday, but just as I said I didn’t feel as “chocolated out” as I had expected I would be, I was presented with a chocolate feast of my favourite desserts from the menu. The Lava cake piled high on a delicious mouse with ice cream and truffles. I swiftly retracted my statement. This finale “chocolated” me out- and I hang my head in shame as chocolate won. The Boucan Hotel Chocolat experience has left us fulfilled with a chocolate infused trip to remember. It’s a relaxing retreat in chocolate heaven. A chocoholics dream. Perfect for a honeymoon or a celebratory trip to the restaurant. It’s possible to have a wedding at the top of the estate overlooking the Caribbean Sea and the Pitons. It can’t get better than that.